이 별전괴불은 별전과 괴불 등의 자수 장식품들을 꿰어 만든 열쇄 패이다. 별전은 조선 인조 11년(1633) 상평통보의 소재인 구리의 질과 무게 등을 시험하기 위해 만들어진 일종의 기념화로 당시 왕실이나 사대부들의 패물이나 애장품으로 사용되었다. 괴불은 오래된 연꽃 뿌리에 서식하는 열매로 벽사(벽邪)의 의미를 갖고 있어서 헝겊 등으로 만들어 어린이나 부녀자들이 장식품으로 애용하였다. 이 별전괴불은 궁중에서 사용한 것이라 전하며 그 형태는 용두문 고리에 달린 주머니형의 동판에 별전, 괴불 등 모두 19줄의 장식이 달려 있는데 그중 3줄은 용두문 고리에 달려 있다. 복주머니의 한 면은 백색 바탕 중앙에 청색 해태 한 마리가 칠보되어 있고 해태를 중심으로 적색·황색·청색의 새들과 난초 같은 꽃 한 송이가 시문되어 있다. 바탕에는‘수복강령(壽福康寧)’,‘부귀다남(富貴多男)’이라는 길상문과 형태를 알 수 없는 문양이 시문되어 있는데 이 문양들은 모두 적색·청색·녹색 칠보로 되어있다. 주머니뒷면은 청색 바탕에 적색 몸통과 녹색 날개를 그린 박쥐 다섯 마리가 칠보기법으로 동판에 음각되었으며 중심부에는 황색 원형 속에 적색의‘수(壽)’자 문양이 칠보장식 되어 있다. 용두문 고리에 연결되어 있는 윗부분은 청홍의 칠보를 한 동물의 얼굴형을 하고있다. 이 복주머니 동판에 16줄의 장식품이 달려 있는데 그 중 7줄의 별전이 황색·적색·연두색의 긴 사각형의 비단 천에 꿰어져 있다. 6줄은 원형의 별전이 9개씩, 1줄은 꽃 모양의 별전 5개와 원형 별전 2개가 꿰어져 있다. 한 줄의 길이는 대략 20~35㎝ 정도이다. 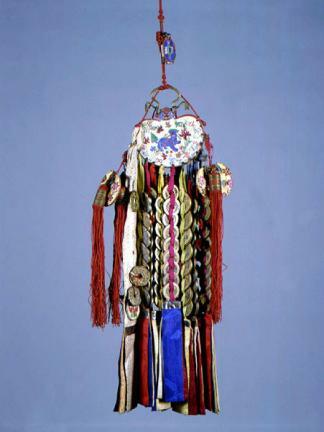 This pendant is a key holder made by threading embroidered ornaments such as byeoljeon and goebul. In particular, the byeoljeon was a kind of commemorative coin minted in the 11th year of the reign of King Injo (1633) of the Joseon Dynasty to test the quality and weight of copper before using the material in the coinage of Sangpyeong Tongbo, a new type of coin. 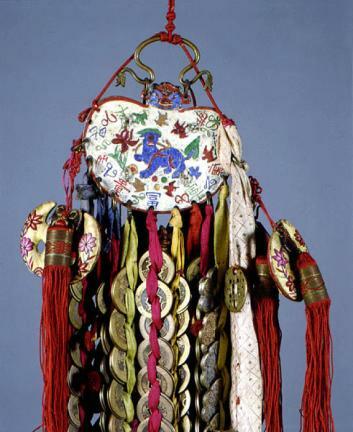 Byeoljeon is known to have been used as jewelry or cherished collection by the royal family or nobility at that time. 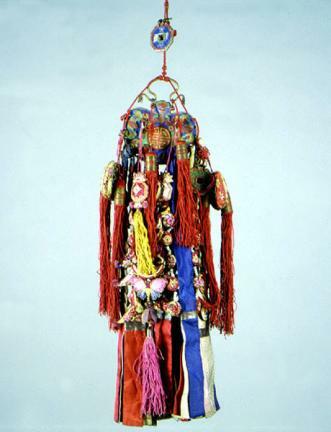 On the other hand, goebul is a kind of plant that lives on old lotus roots and was considered a lucky charm and an evil repellant, so children and women often wore its cloth replicas as ornaments. This pendant is presumed to have been used at the royal court. 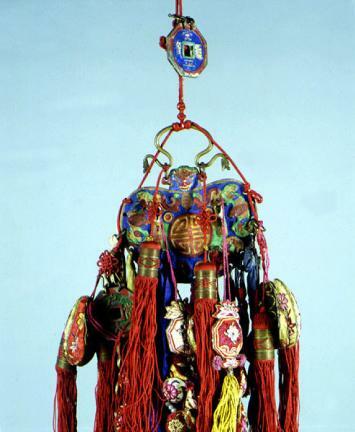 It has 19-threaded ornaments -- including byeoljeon and goebul as well – hung on the pouch-shaped copper plate with a dragon-patterned loop. One side of the plate has a pattern of a haechi, a mythical auspicious beast lined in blue cloisonné at the center on white background. 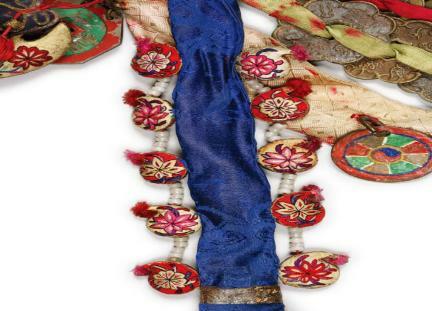 Around the haechi, several birds colored in red, yellow, and blue as well as an orchid-like flower are embroidered. On the background, propitious writings and patterns wishing for wealth and prosperity are beautifully decorated in red, blue, and green cloisonné. On the back side of the plate, the pattern of five bats with red body and green wings is engraved in cloisonné on blue color background. 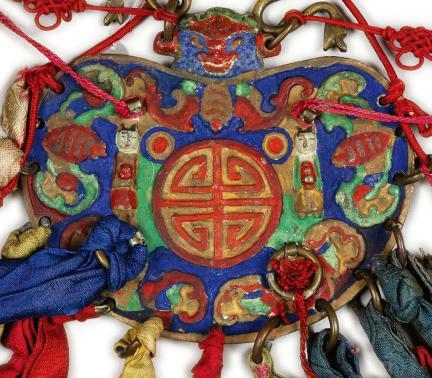 At the center, the pattern of red Chinese letter “壽” (meaning longevity) is decorated in cloisonné within a yellow circle. 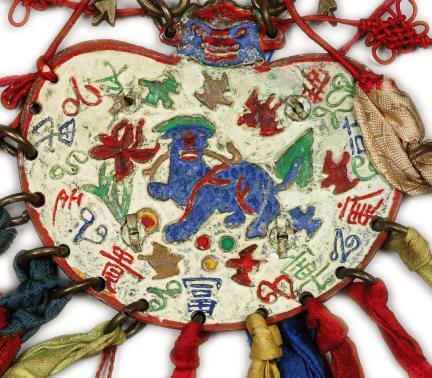 The upper part of the pouch -- which is connected to the dragon-patterned loop -- is made in the shape of an animal face colored with blue and red cloisonné. 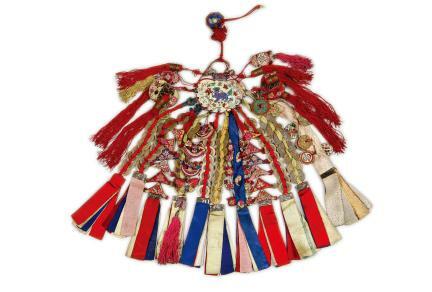 The copper plate of this lucky pouch has 16 ornaments hanging through knotted strings. 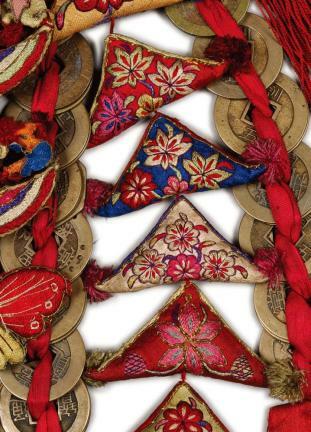 Among the ornaments, 7 byeoljeons are sewn to long yellow, red, and green silk cloth. Each of the six strings has nine round byeoljeons, with one string having five flower-shaped byeoljeons and two round byeoljeons. The length of the strings is approximately 20-35㎝.